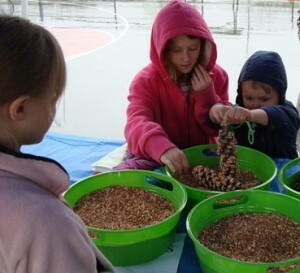 Noa-Lee and Robin Bastien participate in a Girl Scout activity, making birdfeeders from pinecones and seeds, at the Marlborough Earth Day Fair. 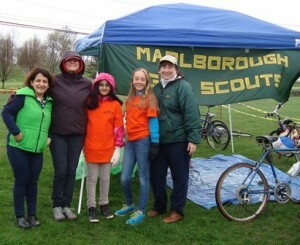 Despite a cold, rainy day, the seventh annual Marlborough Earth Day Fair [April 26 at Ghiloni Park] drew several people again this year. Many thanks to the organizations and people who contributed:? Green Marlborough, Marlborough Girl Scouts, Marlborough Wellness, Junior Women&apos;s Club, Stevie&apos;s Eatery, Immaculate Conception School, Hillside School, AltEStore, the Elks, E.L. Harvey, Earthsong Yoga, Wayside, Community Garden, singer P.E. 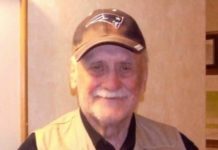 James, the media, the City of Marlborough, and others.? Thank you for thinking globally and acting locally to support community environmental education and health. See you next year! 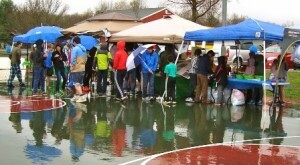 Despite the cold and rainy weather, the seventh annual Marlborough Earth Day Fair drew a small crowd.